The NT-8 pursues a reference-style sound as demonstrated by its mostly neutral tone. However, it is noticeably coloured within the midrange and high-end where it showcases enhanced vocal clarity and a brighter background on behalf of a centre midrange push in addition to middle-treble. Treble manages great headroom and detail presence without skewing excessively bright as a result of its excellent technical ability. This earphone is an excellent example of a high clarity sound without the associated thinness. The first aspect of the NT-8’s low-end that stuck out to me was its extension. It is shockingly good for a BA earphone while maintaining great cleanliness. Sub-bass has a touch of additional emphasis which draws attention to this facet and, as a result, this earphone has solid slam and impressively defined rumble. This provides volume to the NT-8’s sound that a surprising amount of BA earphones lack. Mid-bass is neutral and a more reserved upper-bass instigates a clean sound that isn’t lacking in body but does operate in the absence of warmth. Specifically, this tuning contributes towards a neutrally toned bass with a similarly neutral note size. Control is terrific and bass is lightning fast. It is extremely tight with concise slam that, combined with strong extension, makes the NT-8’s low end quite hard-hitting. As expected, these qualities result in excellent separation producing a hyper-defined low-end, and its strong technical qualities permit the retrieval of fine details and textures. The NT-8 isn’t a bass emphasized earphone, however, it doesn’t come across as remotely anemic either. It is a clean, expansive and superbly detailed, flatters all genres of music. When reference or neutral is mentioned in a review, I usually expect a thinner sound. Yet, though the NT-8 isn’t particularly full or warm, its midrange is quite musical and certainly easier on the ear than most bright tuned monitors. I would attribute this to the lower-midrange with bass/midrange separation achieved through upper-bass as opposed to lower-midrange attenuation in addition to emphasized vocals that draw attention. As the lower-midrange remains well present, midrange notes are filled-in, lacking hollowness and coolness while contributing towards a more natural vocal reconstruction. The centre midrange stands out most, arguably in the whole frequency range to my ears, and this brings vocals to the fore. As emphasis persists into the upper-midrange, clarity is enhanced as is the immediacy of the monitor’s vocals without veering into excessive forwardness, undoubtedly a prime strength of the NT-8. And, as observed on many modern earphones, the NT-8 employs a gradual 4KHz dip to aid density and it sounds delightfully refined and silky smooth as a result. The NT-8 is for the vocal lover. That’s not to say instruments aren’t flattered, the earphone’s extended bass and clean treble ensure they never become overshadowed. It has a neutral tone, excellent transparency and is also incredibly revealing. The NT-8 strikes as a crisp monitor with an open image. This is achieved through a moderate 8KHz middle treble peak that grants foreground details a very pristine sense of clarity while enhancing air. Meanwhile, lower-treble is less present, in line with the earphone’s 4KHz trough. This serves the midrange, aiding a smooth vocal reconstruction while preventing the earphone from sounding bright as middle-treble emphasized monitors usually do. The result is an earphone that retains plenty of foreground detail and a surprising amount of attack that maintains air, openness, and atmosphere without fatigue or sibilance. Higher up, fair upper-treble emphasis can also be observed which highlights the NT-8’s stunning treble extension and resolution. This is an earphone teeming with micro-detail and sparkle, resolution is exceptional, staying true to its status as a TOTL product. Nonetheless, treble isn’t tizzy or off-timbre. 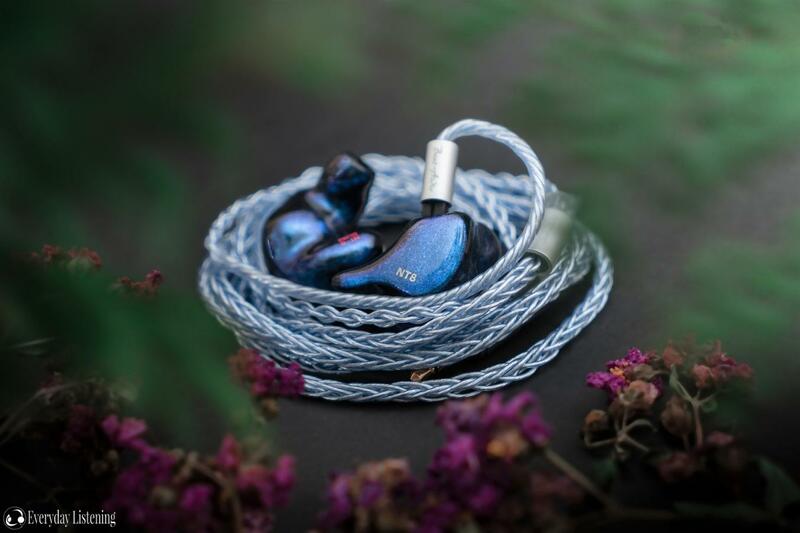 It is a touch thin due to a bias in middle over lower-treble, especially due to attenuation of the 5KHz region, however, few would have problem with the NT-8’s keen ability to balance cleanliness, detail presence, and brightness while upholding outstanding technical ability. Soundstage expansion is a specialty of the NT-8, a by-product of its sensational extension. The earphone flatters live recordings and thoroughly enthralls the listener. Width is especially impressive, stretching well beyond the head while depth, though more intimate, remains a strong performer given that its vocals are fairly forward. Imaging is razor sharp with quick transients, sharp directional cues and a strong centre image for vocals. The NT-8 errs on the side of transparency and neutrality equating to high separation throughout without sounding sparse. The NT-8 is well-layered but layers aren’t hyper-defined like earphones with a darker background. Nonetheless, the earphone has adequate midrange body and enhanced density yet quick decay and a neutral tone that ensure a hyper-defined listen with easily discerned micro-detail and placement. The NT-8 is easy to drive with a 110dB sensitivity and a 16.5ohm impedance. It is also fairly sensitive to hiss and, due to its high driver count combined with a relatively low impedance, is quite source dependent due to output impedance. Pairing the NT-8 with a higher impedance source such as the Hiby R6 immediately yields roll-off on either end, providing a more relaxed sound. Highs are notably muted, lacking crispness and air while vocals become more laid-back. Bass becomes more diffuse and the sound is less focussed in general. Those averse to a bright background may want to experiment with impedance adapters as you do retain a very detailed sound, though undeniably the earphones sound most true from a low impedance source. It sounds great with a bit more current output but some slight warmth subjectively helps the low-end. The DX200 is an excellent mate up top with its crisp foreground and cleaner background that compliments the NT-8’s inverse treble tuning. The result is a meticulously controlled sound with great speed, soundstage expansion and sharp imaging. Though my Pixel 3 has a low OI, it was a markedly less dimensional and dynamic sound, lacking the speed and impact of the iBasso player. Being so resolving, the NT-8 takes full advantage of high-quality sources though its excellent tonality can still be very much enjoyed with any source sporting a low output impedance such as the Shanling M0. Campfire Audio Solaris ($1499): The Solaris is similarly more U-shaped, possessing greater bass quantity throughout in addition to greater treble energy, mainly within the upper treble. With a dynamic driving its low-end, the Solaris provides slightly more extension and solidity at the bottom, reaffirmed by substantially greater sub and mid-bass quantity. It is more visceral, impactful bass. However, it provides this at the cost of speed and detail, possessing neither the definition nor texture the NT-8 delivers in aplomb. The Solaris has a sharper cut to its lower-midrange in order to maintain midrange transparency and it is less linear than the NT-8 as a result. The NT-8 has more vocal presence even though the Solaris similarly employs a vocal presence boost. Both earphones have a 4KHz dip, the Solaris’ is considerably sharper so its timbre isn’t as accurate. In return, it is warmer and fuller sounding, delivering a more powerful midrange that also has high vocal clarity and presence. The Solaris has a 6KHz peak which brings details to the fore. That said, it isn’t more detailed than the more pristine NT-8 even though it may appear so on first listen. The NT-8 has a brighter background whereas the Solaris pursues a cleaner sound. As a result, the NT-8 brings out more background detail. Both earphones have exceptional top-end extension, resolution and enhanced upper-treble to draw attention to this. The Solaris has more upper-treble which grants it more sparkle but also tizzier sound so while it is immensely open and energetic, treble instruments sound a touch off-timbre. Both earphones possess truly grand soundstages, the NT-8 images and layers better as it is more linear but it isn’t quite as expanded as the Solaris. Empire Ears Phantom ($1800): The Phantom is almost the inverse of the clean, bright NT-8 yet it shares a similar focus on vocals. Both of these earphones have shockingly good bass extension for armature earphones, the NT-8 offering a slightly firmer slam and more defined rumble but also less quantity. Meanwhile, the Phantom has clearly warmer mid and especially upper-bass, it’s on the fast side but not to the extent of the NT-8 which tends to pull out more fine detail. The NT-8 is more linear into the midrange where the Phantom has a small lower-midrange dip that prevents congestion in the midst of its emphasized bass. The Phantom similarly employs a vocal boost, however, the NT-8 has slightly more prominent vocals as its bass isn’t as emphasized. The Phantom has a very complete, slightly warm and very coherent midrange though its separation, transparency and clarity are not on the same level. Really this is not to be taken as a negative for the Phantom offers arguably the more natural midrange reconstruction. Treble is directly inverse, the NT-8 having a smooth foreground mated to a bright, airy background, the Phantom having a crisp foreground set to an immaculate, black background. The Phantom has a more aggressive detail presentation though the NT-8 has significantly more present micro-details. The NT-8 has slightly stronger treble extension and this is more apparent due to its brighter tuning. The NT-8 has a similarly wide soundstage and a touch of additional depth. Both earphones image exceptionally well, the Phantom has more defined layers due to its greater background/foreground separation. Noble Audio Katana ($1850): The Katana is a touch more U-shaped, pursuing a more diffuse-field neutral sound with some treble emphasis similar to the NT-8. The Katana does not have the same sub-bass extension but it still has impressive slam for a BA earphone and it undoubtedly tight and hard-hitting. It relies more upon a touch of mid-bass fullness to add some warmth and body. Both earphones are fairly neutral within the upper-bass and lower-midrange. The NT-8 has tighter and harder hitting bass, it has a little more definition through its mid-bass. The Katana, on the other hand, has a slightly more natural midrange presentation. It is tuned very similarly but has a touch more warmth due to its greater mid-bass and also its more neutral vocal region. The Katana remains very clear and also has a small, smooth 4KHz dip that provides a more refined midrange reconstruction. Sibilance isn’t an issue on either earphone. The Katana is a touch more natural while the NT-8 has greater vocal clarity and prominence. And where the NT-8 balances its brighter treble background with a smoother foreground, the Katana has more even emphasis of both the lower and middle treble. As such, it is crisper and more aggressively detailed, but also less refined sounding. It also doesn’t sound quite as controlled in the middle-treble, perhaps due to the bright on bright presentation which hurts its separation and micro-detail retrieval by comparison. That’s not to say the Katana isn’t a technical beast, as it possesses similarly strong top-end extension and a more neutral upper-treble that ensures its instrument timbre isn’t too skewed. The result is a spacious soundstage that has more depth than the NT-8 at the cost of width and slightly sharper imaging at the cost of layering and separation. StereoPravda SB-7 ($2500): The SB-7 is a brighter, leaner earphone that maximises speed, to an even greater extent than the NT-8. What both share is a very impressively extended and super hard-hitting sub-bass. The NT-8 has more quantity and has more body through the mid and upper-bass. As such, it sounds more neutral where the SB-7 is on the lean side. On the flipside, the SB-7 is a touch more controlled and slightly faster, it has insane bass definition. The NT-8 is undoubtedly a fine creation combining agility with tactility and tonal mastery. Outstanding technical traits engage the listener with a signature that is highly refined. Hidition ensures a perfect fit with their stringent ear mould screening and their experienced staff produce an immaculately finished product. The ability to request personalised artwork and up to 3 designs in one housing contributes towards the NT-8’s aura of prestige. The NT-8 secures itself as a firmly TOTL earphone and it has a neutrally toned tuning that is very easy to enjoy. Though not for those wanting big bass, warmth or relaxed highs, the NT-8 impresses with its sublime vocal clarity, speed and superlative resolving power throughout. The NT-8 can be purchased from Hidition for ~$2500 USD. I am not affiliated with Hidition and receive no earnings from purchases through this link.